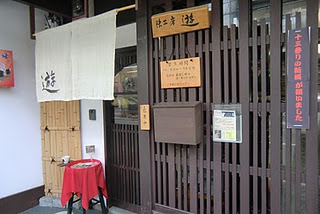 Today,I'm going to visit this dyeing atelier. 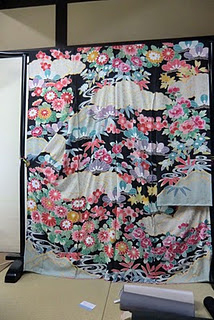 This beautiful Kimono is Japanese Furisode,dyed in this atelier. 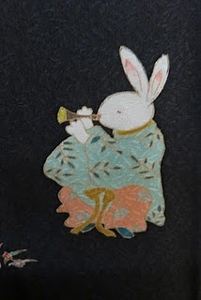 In the old days,beautiful Kimono design,Kimono patterns were sometimes stolen and imitated. That often happens even now. 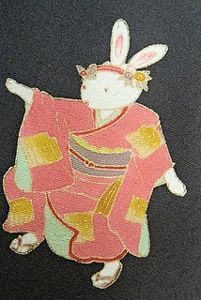 And high-pressure selling of Kimono was rampant in old days, the shop owner said. But these way of selling Kimono become outdated with the current of the times. 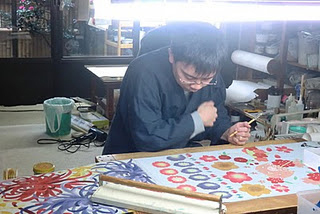 He is a dyeing artisan of this shop.Now he is exercising designing pattern. 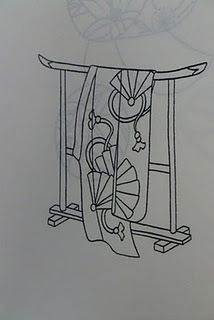 There are many types of dyeing in Yuzen. 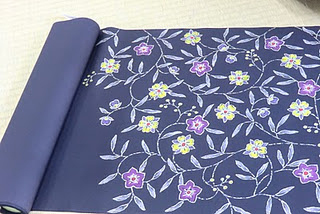 They create Yuzen kimono at this atelier.And we can buy the kimono here. 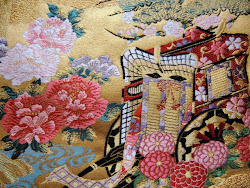 After purchasing the kimono,if you want to repair the kimono,you can entrust this shop stuff. The repair system of this shop is really perfect. That cannot be compared with that of department store,the shop owner Mr.Yamada said. This design was created using the tool above. This way of dyeing is called "Tsutsugaki". 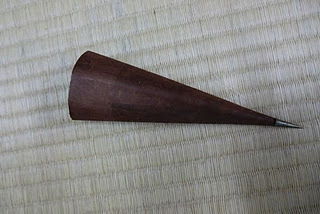 but in Tsutsugaki, a paste is used instead of wax. High skill is needed for Tsutsugaki. 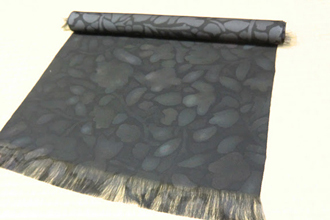 This design is a mixture of two types of dyeing; Batik and Tsutsugaki. 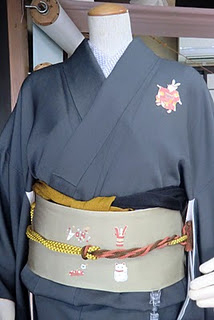 If more than two methods are joinly used,the value of Kimono goes up. This is Obi band.This is Indian design.It is very interesting. This design is also a mixture of two types of dyeing; Tie-dyeing and other way of dyeing. This design is also of high value. This is a beautiful shawl. 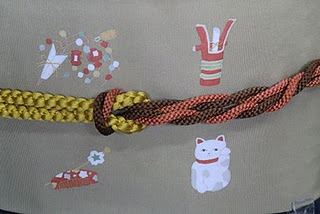 This way of dyeing is called "Danmaru". Melted resin is applied to cloth before being dipped in dye. 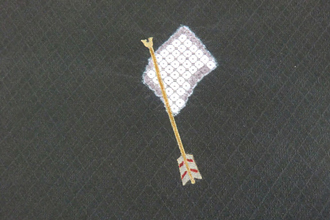 Wherever the resin has seeped through the fabric, the dye will not penetrate. This way of dyeing is also similar to Batik. This way of dyeing needs high skill. 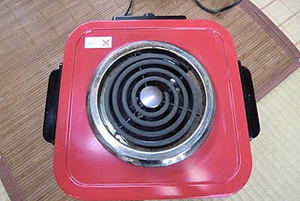 They use this electric heater to dry dyestuff. If dyes run,it ruins everything. This kimono sells very well. 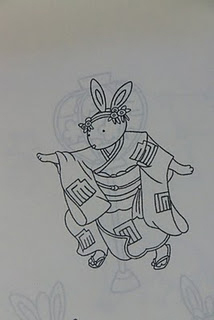 Cute rabbit design is loved by many people. 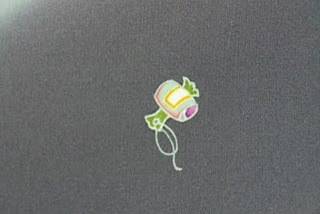 This design is very cute and pop,but high skill is needed to create this. 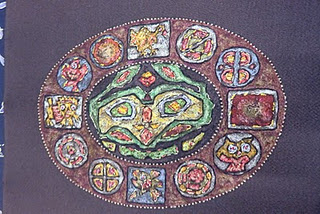 Several way of dyeing are combined to create this design. Every rabbit is described vividly and skillfully. This is obi and obijime. These patterns are very cute. 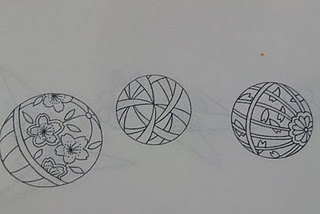 This is a design for kimono. In these days,they use computer graphics to draw this. 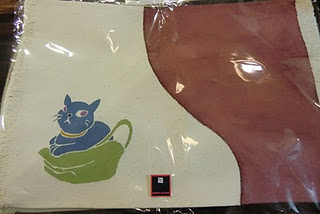 This cute place mat is a souvenir.You can buy it in this Atelier. People in this Atelier are very friendly. Why don't you drop by when you visit Kyoto? I saw photo "Petit Venice" in Colmar on website.